Apple Worcester Pearmain is a delicious apple with a deep red flush on a green/yellow background and a sweet strawberry flavour. 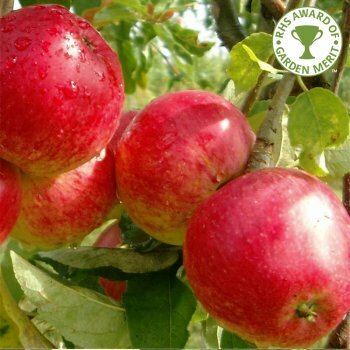 Apple Worcester Pearmain is ideal for children due to its palatable flavour. The apples are white fleshed, crisp and juicy, a very popular eater. As the name suggests this variety is from Worcester in the 19th century - records show 1874. This early cropping variety produces a heavy crop of it's honeyed fruit in early September which is early in the season (an advantage particularly if you are planting more than one apple tree). As a group B apple, Worcester Pearmain requires a pollination partner in group A, B or C to be situated within a half mile radius. A fantastic garden variety. Worcester Pearmain is a pollination group B apple tree and requires a pollination partner in group A, B or C within a half mile radius. Apple trees should be spaced according to their rootstock, for example an MM106 (semi-vigorous) rootstock will require approx. 4.5 metres between trees, whereas an M27 (very dwarf) rootstock will require approx. 1.5 metres between trees.